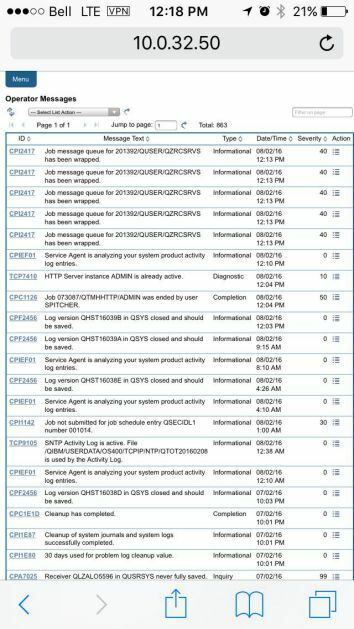 IBM i Access for Web is the newest weapon in the IBM i admin's mobile arsenal. I've been a fan of IBM i Access for Web for a long time. About five years ago, my company started giving tablets to our sales team in the field, and IBM i Access for Web quickly became an invaluable tool for securely accessing green-screen applications. It was a first for us in terms of stepping into the mobile world outside of email. While not exactly the most elegant experience because of the reduced tablet screen size, it functioned well and our users loved it. It worked pretty well on a tablet, but forget about using it on a phone. In the second half of 2012, I wrote two TechTips (1 and 2) about IBM i Access for Web. Those two articles have been read a combined 15,000 times and are ranked five and six on my most-read articles in the last three years and in the top 10 overall. Clearly, people wanted to start working with IBM i Access for Web. But it never had a truly mobile-friendly option...until now. IBM announced this feature about a year ago as part of IBM i 7.1 Technology Refresh 10 and 7.2 Technology Refresh 2. Sadly, I think it got buried a little, with news about Java 8, Python, JSON, and native flash storage being the headline grabbers. But for me, making the IBM i administrator mobile is the hidden gem in that announcement. Good news for you! It's at no cost to the customer as it's covered under the IBM i Access Family licensing. This is just one of those things that your software maintenance pays for. 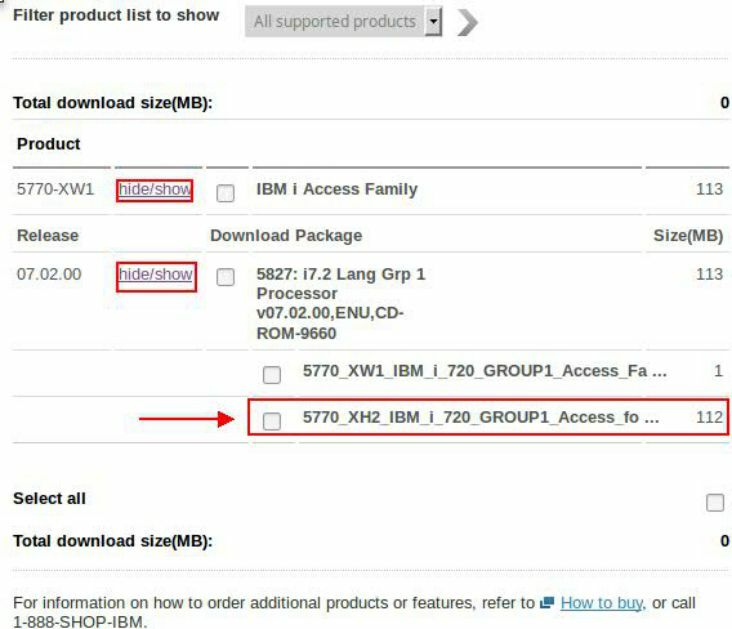 You need to download the IBM i 7.2 version of IBM i Access for Web (5770-XH2) from the IBM Entitled Software Support (ESS) website. That's right...make sure you grab the 7.2 version. Don't be alarmed; the 7.2 version will work fine on 7.2, 7.1, or 6.1. Since the ESS website is about as user-friendly as Passport Advantage, I'll walk you through the steps of downloading it. On the ESS website, click on My Entitled Software and then Software Downloads. For operating system, select IBM I, and for version, select V7R2. Now, it asks you to select the software you wish to download. Put a check in the box next to 5770-XW1 IBM i Access Family and hit the Continue button. Choose your language on the next screen and hit Continue again. On the next screen, you'll have to hit the hide/show link a couple of times to expand all options. Then you can download the IBM i Access for Web product by clicking the checkbox next to the option that's 112 MB. Unfortunately, the name is so long that the name IBM i Access for Web doesn't show up on the screen. You have to put your mouse over it to get the tooltip text. Once you've downloaded via Download Director or HTTP, you'll have a zip file called 5770_XH2_IBM_i_720_GROUP1_Access_for_Web_LCD8_2164_00.zip. Unzip the file and you'll have a file called 5770_XH2_IBM_i_720_GROUP1_Access_for_Web_LCD8_2164_00.udf. For ease of operation and for this example, I've renamed my file 5770_XH2.udf. Next, you'll need to install the product on top of the current 5770-XH2 install. You'll need to FTP the 5770_XH2.udf file to the Integrated File System (IFS) of your IBM i partition. I just put mine on the root since it's only going to be there for a few minutes. Now, you need to add the udf file to the image catalog as an image catalog entry. Now, load the image catalog to the virtual optical device. Now, you just need to install the product. I would stop the *ADMIN HTTP server before doing this next step. Now that the program has been restored, you need to download and apply PTF SI56123. The command will open up a shell window and will display status or any errors during the configuration. Ideally, you'll get a successful completion message and you just press Enter to continue. At this point, you'll need to start your *ADMIN HTTP server again. 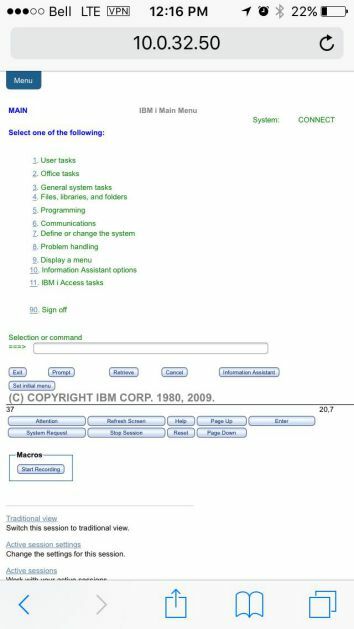 Now you'll be able to access the mobile interface for IBM i Access for Web via a web browser on the following address: http://yoursystem.yourdomain.com:2001/iamobile. Of course, you'll need to have access to the same network that your IBM i is on by way of WiFi, VPN, or NAT rule through your firewall. Do yourself a favor and bookmark the address in Safari or whatever mobile web browser you use. Here are screen shots from my phone of me accessing an IBM i partition. You'll notice it renders much nicer than the standard IBM i Access for Web interface. Figure 1: As you can see, the main menu looks like a proper mobile interface. It's responsive in that it will adjust properly to the screen size, whether it's a 24-inch monitor or a tablet or a phone. Figure 2: Working with active jobs is easier than expected. Take note of the handy filter field on the top right corner and the action link on the right side of every job. The action link gives you the ability to hold or end the job, view the job log or spooled files, plus view the job's properties. Figure 3: Need to view the contents of a DB2 table? Need to edit a file quickly? Add a record? You can! 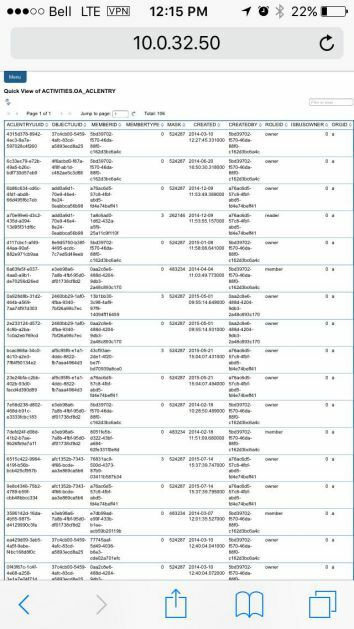 Figure 4: While I was taking screen shots for this article, I also checked out the IFS. I found the 5770-XH2 UDF file that I transferred to my system. From here, I was able to delete that IFS file. That's pretty slick. Figure 5: Of course, the real bread and butter: the 5250 session. 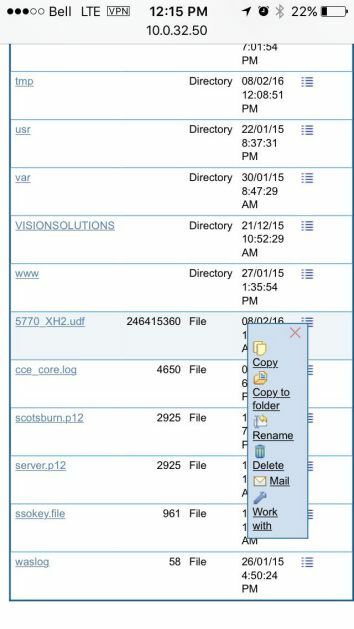 You have the ability to log into a 5250 session just like in the standard IBM i Access for Web. I wouldn't expect you to key purchase orders, but it just might save you in a pinch. Figure 6: Again, another must-have feature. Having this feature in a mobile-friendly format gives you the ability to answer operator messages on the side of the highway when you don't have your laptop with you. 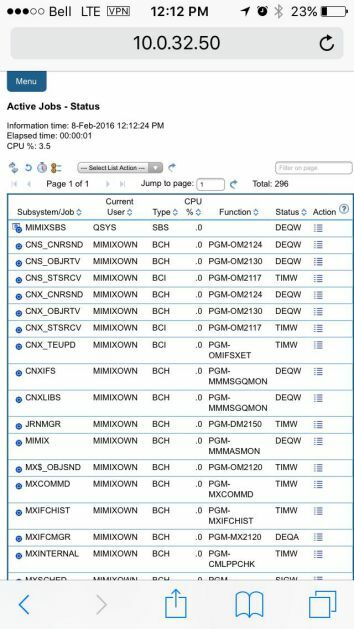 Are there other products out there that give you a better IBM i admin toolkit on your phone? To be honest, yes. There are a few ISV solutions that are really awesome and feature-rich. Are there better free solutions? Absolutely not. IBM i Access for Web gives every administrator the ability to use their smartphone to jump on their systems and do the kind of rudimentary work that keeps the business going. This is what this tool is made for, in my humble opinion. I'm stuck in traffic and need to end a job that's killing the system? I've got a mobile interface. I'm on the morning train? I've got a mobile interface. I'm out for lunch? I've got a mobile interface. Every IBM i administrator has now been empowered to pivot and execute on the fly.